Bowthorpe is a large, modern planned suburb to the west of Norwich, the nearest thing the Norwich area has to a new town. It was built on an entirely green field site within the city boundary. The parish of Bowthorpe had emptied in the years after the Reformation, leaving only the Hall and the ruin of the parish church. The plan was for three connected villages, each with its own character but built in sympathetic styles, linked together by a central shopping area, with an adjacent industrial area on the Dereham Road. The placing of the industrial area not only meant that it was on the nearest major route, it also kept the Bowthorpe residential area separate from the anonymous sprawl of the New Costessey estate across the Dereham Road. Unfortunately, as this is the main way into Bowthorpe, the dreary industrial area is most people's first impression of the place, which is a little unfair. As is usually the case, things did not quite turn out completely as envisaged. The first village, Clover Hill, was begun in 1975, and its courtyard style seems to have been based on the traditional courts of the Elm Hill area of central Norwich. Unfortunately, the density was much too high; and, as someone pointed out when it was too late, the trouble with the Elm Hill area is that by the 19th Century it was slums. There was a laudable attempt to keep traffic out of Clover Hill, but this created further problems by making car ownership inconvenient, a lack of foresight perhaps considering that we are nearly five miles from central Norwich here. These problems were addressed to an extent in the construction of the two other villages, Chapel Break and Three Score. As you might expect, the central shopping area evolved into what is little different to any out of town shopping centre, with a vast Sainsbury's superstore and a Roy's superstore beside it. Most people do their shopping by car. There are some good individual buildings, the best of which are the schools. The only older structure is the ruin of the medieval church of St Michael, which sits at the top of Bowthorpe beside the modern Church Centre. The total population of Bowthorpe is now about 15,000 people. Estates like Heartsease on Norwich's east side, which had been built in the earlier post-war period, were usually planned with three designated churches, Anglican, Catholic and non-conformist. By the late 1970s the fashions were changing, and modern estates were instead assigned an Ecumenical Partnership church which could be used by all traditions and none. 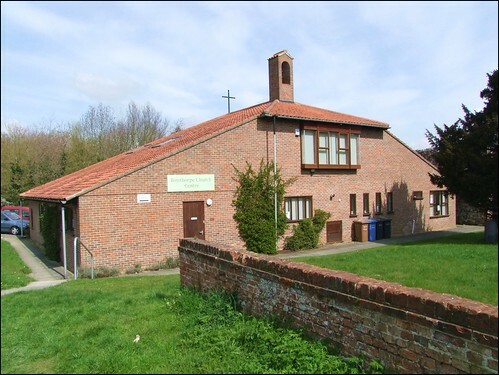 These covenanted partnerships vary in their success - in some parts of East Anglia some traditions prefered not to be involved, or left the partnership when things got difficult, but generally Bowthorpe's ecumenical church has worked well. It was built in 1978 on the inner side of Clover Hill, and as well as being used by the main church traditions it is also in regular secular community use. The frontage is of glass, flooding the interior with light, and a dramatically pitched roof leads the eye up from the road. The back of the church is quieter and more traditional, with a little bell turret above the brick wall looking out over a lawn. Beyond is a garden of remembrance, from which you can enter the ruins of St Michael, the original parish church of Bowthorpe. The architect was Peter Codling. The church was originally known as the Open Door Church Centre, a laudable intention, perhaps. The name transmuted in the 1990s into the neo-California style Bowthorpe Worship Centre, but today the signs tell you that this is the rather more traditional Bowthorpe Church Centre.